Sometimes it seems we know the biblical stories so well we don't actually understand them. I find it too easy to sit on a nice padded pew in a stained-glass sanctuary and smile while the preacher reads a familiar biblical text. Then I can nod my head, thank the pastor on the way out the door, and act like nothing's different. Perhaps no parable demonstrates this more than the one we usually call "the parable of the good Samaritan." Fortunately, some modern characters recently reenacted of this parable on a road in Germany. Stefan Jagsch, a member of the anti-immigrant National Democratic Party in Germany, crashed his car into a tree near Büdingen. An outspoken critic of Germany admitting refugees, he is part of a political party criticized as "neo-Nazi" and known for xenophobic rhetoric. Suffering two broken legs and facial lacerations, Jagsch soon found himself helped by a couple of "good Samaritans." In true biblical fashion, the helpers were the last people Jagsch would expect - or want. Two Syrian refugees pulled the seriously-injured man from the wrecked car and performed first aid. As it turns out, we know the story of the "good Samaritan" so well we often miss the point. In our churches, when the pastor starts the story, we can elbow the person next to us and proudly whisper, "I bet the good guy is the Samaritan" even though we don't have a clue what a Samaritan is. But when Jesus started the story, no one in his Jewish audience expected the hero to be a Samaritan. When Jesus mentioned a man was badly beaten on the road from Jerusalem to Jericho, someone likely elbowed the person next to them and angrily whispered, "I bet he was attacked by one of those ... [fill-in-the-blank] ... Samaritans." But the word filled in was not "good." As I watch politicians in Germany, the United States, and elsewhere pass laws to criminalize and punish refugees and others who are among the "least of these," I recognize the need for us to hear the parable of the good neighbor in our own context. If Jesus stood before us today, he wouldn't talk about Samaritans. The story would need a new twist to shock us in the end. Perhaps he would talk about Donald Trump being helped by an undocumented Mexican immigrant. Or perhaps he'd mention Ted Cruz being helped by an LGBT activist. 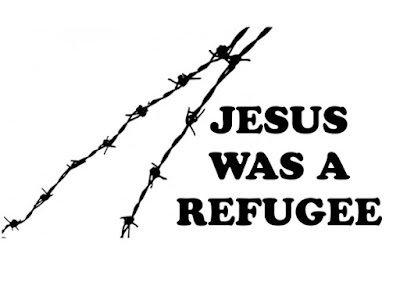 Or perhaps the best version Jesus could give today would be about a far-right, hyper-nationalist, anti-refugee, neo-Nazi politician being helped by a Syrian refugee.